The ECS G33T-M2 motherboard is based on Intel's news integrated graphics chipset, the G33 Express, and like the Intel P35 Express makes an awesome duo when paired with a dual core Intel Core 2 Duo processor... or a new 1333MHz FSB CPU for that matter. This board is also interesting because it's the first platform to pass through the PCSTATS test labs without an IDE slot. That's right, no more IDE!? Set to directly replace the G965 chipset, the ECS G33T-M2 motherboard utilizes Intel's new G33 Express and ICH9 chipsets; the latter is a rehash of the ICH8 with a couple extra ports. The IDE deficiency of this platform might make you a bit wary, but know that the board has four Serial ATA II slots and 12 USB ports (4 on the rear I/O), so you should be able to get an optical drive to fit somewhere. More importantly than a lack of IDE, is that the G33 Express marks the entry of Intel's newest Graphics Media Accelerator. The GMA3100 is a Direct 9.0C integrated videocard, and that means it will run Microsoft Windows Vista's AeroGlass. Very important if you're setting up some office workstation computers with Windows latest operating system. If you're looking to build a low cost system that supports higher bandwidth 1333 MHz FSB processors and rely on cost effective integrated video, this board will get you where you need to go without any frills. The ECS G33T-M2 motherboard supports Socket 775 processors which run at an 800/1066 or 1333 MHz FSB. That means older Intel Pentium 4/D and Celeron D CPUs which operate at a 533 MHz FSB will not function on this motherboard. This is important to remember if you're going to be upgrading. This 1333 MHz FSB capable Intel G33 Express chipset also brings in support for Intel's latest 'Wolfdale' Core 2 Quad and 'Penryn' Core 2 Duo processors. The boards' four DDR2 memory slots can be occupied with 8GB of DDR2-667/800 memory. Rounding out the list of features is the of course the integrated Intel GMA 3100 videocard, Gigabit networking and 7.1 channel High Definition Azalia audio. There is one PCI Express x16 expansion slot for videocards, one PCI Express x1 slot for high bandwidth devices and two PCI slots for legacy cards. With a retail price of $110 CDN ($105 USD, £51 GBP), the ECS G33T-M2 motherboard is right up a workstation user's alley. At first glance it's easy to see that the ECS G33T-M2 is a no frills motherboard but that's okay. The layout is pretty good and everything is "where it should be". Don't put the manual away just yet though, you'll need it when setting up the front panel I/O header and USB headers. The fate of the parallel IDE standard was decided by Intel back in 2004 when it released its ICH6 Southbridge. Noticeably gone from the storage specifications was any mention of IDE and the 40 pin storage standard that PC users have become accustomed to for the last 20 or so years. As Intel has done away with IDE in its latest chipsets, it was only a matter of time before the other chipset makers followed suit. Motherboard manufacturers on the other hand build their systems to accommodate consumers, and it's obvious that consumers do not feel the same way about IDE. For the last three years virtually every motherboard on the market has supported IDE, if not through the Southbridge then with the use of a separate IDE controller. The only issue holding Serial ATA back from taking over the storage landscape was how long it took optical drive manufacturers to support the standard. That's no longer a problem as every optical drive manufacturer from Plextor to Samsung, Pioneer, LG and Lite-On now have Serial ATA alternatives available. Err... it only took these guys what, 3 years to figure that out. Yikes! On the ECS G33T-M2 motherboard we find four USB 2.0 ports at the rear I/O, along with the 15 pin D-sub or analog connector. It's a shame ECS didn't include a DVI port or TV output options with this board too. The Gigabit network card is a nice touch and ECS places the MAC address on the top which makes things easier for network administrators. The Intel ICH9 Southbridge technically supports six Serial ATA II ports, so we're a bit surprised to see only four slots on the PCB. 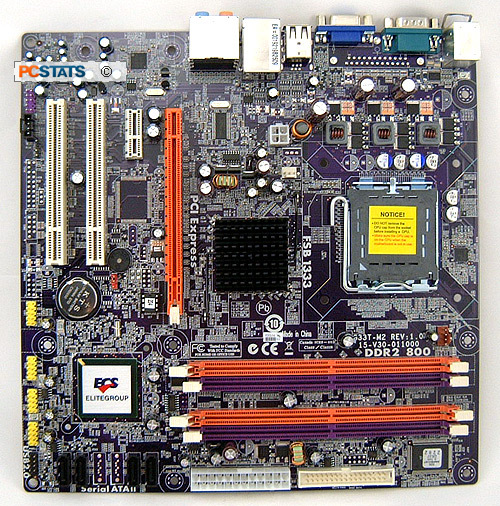 ECS uses the vanilla version of the ICH9 with its G33T-M2, so that board does not support RAID. If you're upgrading an older computer which uses an ATX 1.4 spec power supply don't throw it out just yet as the ECS G33T-M2 is compatible. Just make sure it has enough juice on the 12V line (30+ amps) and you'll be fine. The only thing I will complain about on the ECS G33T-M2 motherboard is the PCI Express x16 videocard lock. You've probably heard me complain about this in the past, but it's the absolute worst piece of engineering I've ever encountered. It boggles the mind why something so user un-friendly is used. Have a set of tweezers handy to reach the lock... reaching it is very difficult.